Ana Maria Almeida de Sousa1, Daniel Mochida Okada2, Fabio Akira Suzuki3. teaching materials, anatomical models, otological surgical procedures, otolaryngology. Introduction: The teaching method of "learn by doing it'' was created by Halsted e col. In the beginning of 20th century creating the first model of medical residence in the world. This learning develops in three phases: cognitive, associative and autonomous, through an ascending curve. The simulators appeared in the last years as a complement to the cognitive phase, adding efforts to the training, performed before only in animals and cadavers, ever more hampered by medical and legal dilemmas. Objective: Describe and compare the various types of simulators available for the learning of otological surgery. Data synthesis: The model of simulators are divided mainly in real and virtual models, each having its peculiarities with positive and negative points. The main point of each one of them is the sensory feedback granted by each one of them, what we call it haptic reality: coloring of the structure dissected; listening to the corresponding sounds; as the drill or vacuum; presence of a joystick that simulates the pen motor; use of glasses or even a microscope for three dimensional view; use of a real otologic surgical instrument. The cost of the differents types of simulators is also a key point for the implementation of them in the daily reality of the training centers. Is important to mention that some of these simulators allow the training students and can be objectively evaluated by the simulator itself. Conclusion: Simulators are seen as a complementary tool for training and improvement of the otological surgeons. With the creation of the first american residency program in surgery, by William S. Halsted, in the John Hopkins Hospital, in the beginning of the 20th century, was created the teaching method of "learn by doing it", which the resident assumes increasing levels of independence and responsibility (1). This progressive gain of knowledge involves numerous medical-legal issues, but many studies show a reduction of this kind of problem like previous training in animal models, corpses and simulators. It is important to remember that this process is, according to the theory of FITSS and POSNER, three distinct phases: cognitive, associative and autonomous, where the student goes through a increasing curve of learning for the acquisition of knowledge (2). In recent years, simulators have emerged to improve the cognitive phase, for the student to get to the training phase in humans, more prepared and aware of the arsenal of instruments and techniques available, through extensive previous training. Before, the training was made only in animal models and corpses, but this is limited due to increasing difficulty for obtaining (3), the simulators are responsible by the progressive filling of this gap. So, this present work has as goal to describe and compare the many available simulators to the learning of the otological surgery found in the literature. The otorhinolaryngology is a surgical specialty well covered with simulators for technical improvement. In otology we have simulators that allows from the training in myringotomy to dissection complex three-dimensional of structures of temporal bone. VOLSKI e col. (4) described a model developed to the training of myringotomy and insertion of ventilation tubes. Constituted by three units: channel, coupler and head. The simulator promises to present the same texture, color, opacity and elasticity of the human ear. Has the financial advantage, the possibility of exchanging only the coupler who contains the tympanic membrane to be reused. This model proved to be useful to resident training in the beginning of the surgical learning, with improvement of the time and execution technique of the procedure, although they have not proved to be so useful to improvement of experienced surgeons. Seeking similar interactivity and realism of the dissection of a cadaver in laboratory, WIET e col. (5) developed a virtual model to dissection of the temporal bone. Developed by a computer program, the Simulator allows to visualize in three dimensions through a special binocular system, that stimulate a microscope, with good image resolution, also promotes a good tactile sensitivity through a device of haptic reality, similar to a joystick (Image 1), simulating the milling and irrigation, besides allowing the hearing of the sound emitted by the engine in different harmonic scales, depending on the type of drill, as well as the sound of the vacuum suction, giving a good feedback to the user. The model was fully developed from tomographic images of temporal bones of corpses reconstructed by computer, to faithful reproduction of dissection. The system also has the identification mode of anatomical structures, where is possible to individual study: the system prompts the user to point a specific structure, as well as show the structure and asks to the user to name it. Has the demonstration mode, that rescues the complete dissection already made and taped. The german group of ZIRLKE (6) also developed a model of simulation of the temporal bone which includes special glasses to three dimensional vision, plus pedal to virtual control of the engine, that have the sensitive control of the milling. Is also possible to adjust the magnification of the image. It is a simulator composed by a special structure (Image 2) that simulates a drill with a joystick that mimics the actual sensitivity. This model can evaluate the user, through numerous performed movements, speed of the movements, total time of execution of the procedure and effectiveness of the movement. This assessment can serve as to compare the beginner user and the experienced one, how to evaluate the evolution of them. However, the model doesn't use the real color of the structures that are found while dissecting temporal bones of corpses. O'LEARY e col. (7), has a model that is different from the ZIRLKE e col. (6) by the absence of pedal, but count with a probe for the monitorization of the facial nerve, plus if there is bleeding milling from the sigmoid sinus. Have the shape of a bench, with special glasses and a pen that simulates a drill, with hearing and sensitive feedback. The zest of bones accumulates until being aspirated. The simulator present the structures with the real colors in vivo. Also was developed from tomographic images. Allows the identification of the structures as they are found during the dissection, although do not contain a system of evaluation. The virtual German simulator of SORENSEN e col.(8) can be obtained by internet as a freeware allowing the training at home (Image 3). Is a type of model that allows the evaluation of the user, through the obtainment of a score from zero to ten, depending from the success of preservation from the structure. However, needs a graphic card of high resolution for a good performance of the program and do not contain mechanisms that allow the haptic feedback for free as the program. It contain a joystick acquired separately, although can be used just by the mouse. 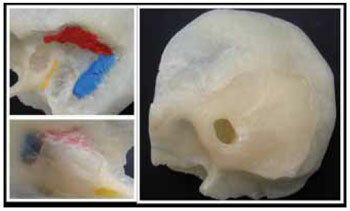 More recently, BAKHOS e col. (9) published their work showing a real simulator for the dissection of the temporal bone. Based in tomographic cuts and using the technology of fast prototyping already reproduced in other works (10,11), the author developed a prototype for the temporal bone, that, after performed all the measures and concluded all microdissections, was noticed that the models were very similar to the temporal bone of a cadaver (image 4), that was made a tomography for the obtainment of a prototype. This model allow the use of their own materials that are used during the surgery and use a material similar to the bone, reproducing a very close to real dissection in what concerns the haptic reality. 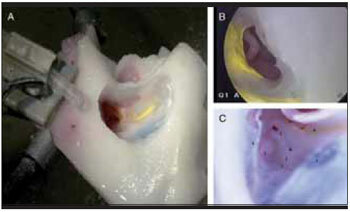 OKADA e col. (12), in Brazil, developed a model of real temporal bone, by the use of the temporal bone from a cadaver donator and, using a molding of a thermoplastic resin, obtained a prototype from the temporal bone that was analyzed by experienced ear surgeons, that pointed as a good complementary element for the surgical training. As seen in the Image 5, is similar to the model of BAKHOS e co. (9), but without the need of using the prototyping equipment, reducing the costs of confection of the model. Image 1. Model of WIET (5). Image 2. Model of ZIRKLE (6). Image 3. Model of SORENSEN (8). Image 4. Model of BAKHOS (9). Image 5. Model of OKADA (12). The learning for the execution of the surgical procedure, by many authors, used to be divided in three phases: 1) didactic phase, when is acquired knowledge about the instrumental and techniques to be used, including the training in artificial models, in animals and cadavers; 2) the phase of human training under supervision; and 3) the practice phase, when there is a progressive increase of independence from the new surgeon, with the concomitant acquisition of competence (13). In the theory from FITTS and POSNER, these phases are categorized as cognitive stages, associative and autonomous, having gain of automation and a decrease in the mistakes along the process of acquisition of knowledge (3). The simulators are a learning technique, and not a technology, used to reproduce real situations in a environment closest to the real one (14). They can be used for training and evaluation. The evaluation from simulators can be formative (gives a feedback to the user so that he can improve himself) or a summation (the user need to reach a determined level of ability to pass to the next level). The evaluation can be intern (made by the simulator itself) or extern (made by someone more experienced that accompanies the examined one) (6). The simulators already showed their efficiency in the training of pilots and astronauts in military operations (15), gaining a increasing space in many areas of medicine, mainly the surgical ones. JACKSON e col. (16), in his review from the art of development of a simulator, describe the characteristics that must have in a good model, including the bases from virtual reality and ergonomic considerations in the drawing of the systems. He still highlights the ways of obtainment from the anatomic reconstruction, including tomographic cuts and histological. 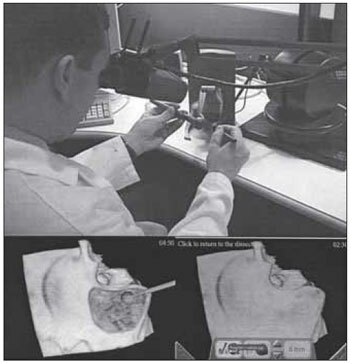 Dexterity, knowledge and experience are the most appreciated characteristics by the author for the performance of the procedures as in the mastoidectomy, cochlear implant and surgery in the cerebellopontine angle and simulators that have their own importance for the acquisition of those surgical abilities. In the Table 1 we can visualize and compare the many types of simulators described in this work. The virtual simulators have an elevated cost when compared to a real simulator, but allows to be used many times through the initiation from the program, besides giving opportunities to the user to be evaluated. However, there are programs in the computer that can be acquired from the internet, freely, but that reproduces only the visual stimulation of a dissection, not allowing the development from the surgical dexterity. Besides, for as simple as it can be the simulator, he needs a video card of high resolution for a good performance of the program, which already brings costs for the dissection. The real simulators allow the user to have sensations very closely from the dissection of corpses, because use models with texture and similar material to the human bone, besides the user can use materials similar to the used in the surgeries. Besides, the use of a fast prototyping, by means of stereolithography, makes us so that, through a tomography of a real patient, develop a model to dissect previously the surgery, for example, allowing predicting the real difficulties that it can be found in a real surgery. And so, we can conclude that the simulators are seen as a tool to complement the training and improvement of ear surgeons, because of the increasing difficulty and many times the prohibition of the temporal bones in cadavers. Is important to highlight that the evaluation of the student, in a process of acquisition of knowledge, must be in a constant process of evaluation from a more graduated observer, so that is obtained a maximum use from the associative phase and acquisition of abilities. The upgrading from the development of simulators, focused in the improvement of the sensitive feedback from the models, mostly in what concerns to the hearing recurrence, visual and tactile, will make them every time more useful and faithful to the reality, for a good training from the user. However, simulators hardly will substitute the dissection of the human temporal bone in his integrity, because of the intriguing complexity from its anatomy and consequently the difficulty into reproducing it. 1. Glaser AY, Hall CB, Uribe JI, Fried, MP. The effects of Previously Acquire Skills and Sinus Surgery Simulator Perfomace. Otolaringol Head Neck Surg. 2005, 133:525-530. 3. Mills R, Lee P. Surgical Skills training in middle-ear surgery. J Laryngol Otol. 2003, 117:159-63. 4. Volsky PG, Hughley BB, Peirce SM, Kesser BW. Construct validity of a simulator for myringotomy with ventilation tube insertion. Otolaryngol Head Neck Surg. 2009, 141:603-08. 5. Wiet GJ, Stredney D, Sessanna D, Bryan JA, Welling B, Schmalbrock P. Virtual temporal bone dissection: An interactive surgical simulator. Otolaryngol Head Neck Surg. 2002, 127:79-83. 6. Zirkle M, Roberson DW, Leuwer R, Dubrowski A. Using a virtual reality temporal bone simulator to assess otolaryngology trainees. Larygoscope. 2007, 117:258-63. 7. O'Leary SJ, Hutchins MA, Stevenson DR, Gunn C, Krumpholz A, Kennedy G, et al. Validation of a Networked Virtual Reality Simulation of Temporal Bone Surgery. Laryngoscope. 2008, 118:1040-46. 8. 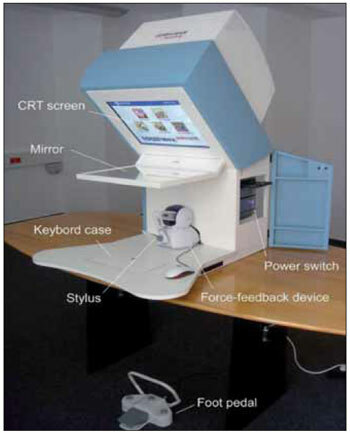 Sorensen MS, Mosegaard J, Trier P. The visible ear simulator: a public PC application for GPU-accelerated haptic 3D simulation of ear surgery based on the visible ear data. Otol Neurotol. 2009, 30:484-7. 9. Bakhos D, Velut S, Robier A, Al zahrani M, Lescanne E. Three-Dimmensional Modeling of Temporal Bone for Surgical Trainning. Otol Neurotol. 2010, 31:328-34. 10. Suzuki M, Ogawa Y, Kawano A, Hagiwara A, Yamaguchi H, Ono H. Rapid prototyping of temporal bone for surgical training and medical education. Acta Otolaryngol. 2004, 124:400-2. 11. Lopponen H, Holma T, Sorri M, Jyrkinen L, Karhula V, Koivula A, et al. Computed tomography data based rapid prototyping model of temporal bone before cochlear implant surgery. Acta Otolaryngol Suppl. 1997, 529:47-9. 12. Okada DM, Sousa AMA, Huertas R, Suzuki FA. 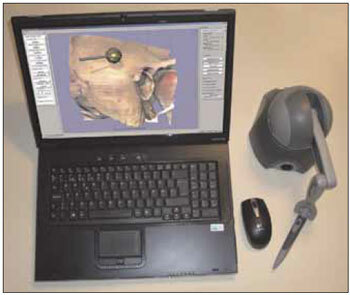 Surgical simulator for temporal bone dissection training. Braz J Otorhinolaryngol. 2010, 76(5): 575-578. 13. Manu P, Lane TJ, Matthews DA. How much practice makes perfect? A quantitative measure of the experience needed to achieve procedural competence. Med Teacher. 1990, 12:367-9. 14. Deutsch ES. High-Fidelity Patient Simulation Mannequins to Facilitate Aerodigestive Endoscopy Training. Arch Otolaryngol Head Neck Surg. 2008, 134:625-629. 15. Issenberg SB, McGaghie WC, Hart IR, Mayer JW, Felner JM, Petrusa ER et al. Simulation technology for health care professional skills training and assessment. JAMA. 1999,282:861-66. 16. Jackson A, John NW, Thacker NA, Ramsden RT, Gillespie JE, Gobbetti E, et. al. Developing a virtual reality environment in petrous bone surgery: a state-of-the-art review. Otol Neurotol. 2002, 23:111-12. 2) Master in Health Science IAMSPE - HSPE. Assistant of Otorhinolaryngology Service from Hospital of State Public Servant of São Paulo - IAMSPE. 3) Doctor in Otorhinolaryngology - UNIFESP. Director of the Center of Development of Education and Research of Hospital of State Public Servant of São Paulo - IAMSPE. Article received in September 23th of 2010. Article approved in February 5th of 2011.